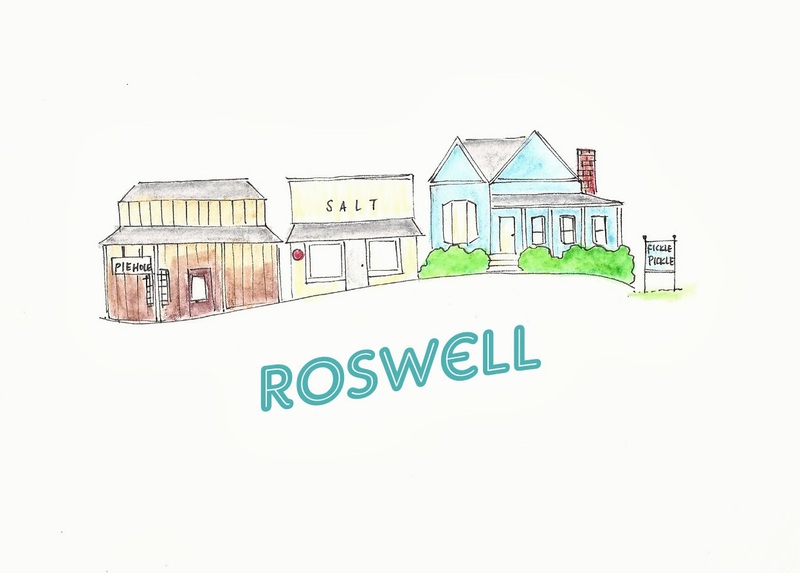 Roswell, Georgia is just a short drive from my home in Marietta, but I don't make it there nearly often enough. Amber of Arbitrary Ambrosia is touring us around this quaint Georgia town. Amber's blog is full of style, with plenty of music and magic. I'm a big fan of her Fashion Spark series! What do you love about this hood: While I don't live here, charming, southern Roswell and it’s tree-lined, brick sidewalks of Canton Street stole my heart early on in my relocation to Atlanta. Yes, its OTP, but this old mill town is rich with history, Antebellum homes, boutiques and amazing restaurants removed from the hustle and bustle of Atlanta’s city center. Favorite breakfast: Artisan Foods. This hidden little cafe is a great spot for breakfast right in the heart of downtown Roswell. It's order at the counter style and mismatched tables create a warm and welcoming atmosphere with consistently delicious food. I could start out every morning by enjoying their fresh coffee and tasty beignets. Favorite coffee stop: it’s a toss up between the philenthropic, "do-good" coffee of Land of a ThousandHills and the latte's at the beautifully decorated European marketplace, Roswell Provisions. Best working lunch: Fickle Pickle. This spot gets my number one lunch spot vote simply because of its cute and catchy name. Add the over sized pickle outside and I'm sold. Aside from the catchy name, they have delicious sandwiches and their fried pickles (go figure) are to die for. Best date night bet: Table and Main. Self described as a southern tavern and bourbon bar, this cute restaurant sure has gotten it right. Located in a cozy, southern house, the atmosphere is ideal and the food is even better. Its romantic without being pretentious and their shrimp and grits certainly pass my southern test of approval. Best meeting friends for drinks: Salt. Ambiance is one of the biggest things for me when I'm going to grab a drink or two with friends. This restaurant is both rustic and hip with its cool exposed brick and subway tile lined interior and grounding wood accents. Having a good happy hour is an added bonus. Favorite dessert stop: Douceur de Fance. French pastries- need i say more? Donuts, pie, or ice cream: The Pie Hole. Pie shops are the new "it" thing in the dessert world, and I have to admit, after treating myself to an enormous slice of the Pie Hole's peanut butter pie (peanut butter is my dessert weakness) I can understand why. This place is cozy, cute, has a good variety of pies, and most of all, its just fun to say. Diner, greasy, grab and to-go dinner: Rhea’s Take OUT Foods. This place is definitely not high on ambiance but the burgers more than make up for it. Rhea's Special with Double Meat: Two patties with "everything" is the way to go. Farmer’s Market: Riverside Farmer’s market. Every Saturday from May to September you can find live music, special events, and some of the best locally-grown produce and products around. Me, personally, I can never pass up on a jar of Lavender Wind Farm’s strawberry lavender jam. Non-food shopping: 425 Market Place Antiques. I am a huge fan of antique shopping and being located in such a history rich town, you can imagine the great gems you can find among the eclectic dealers that call this market place home. Many thanks to the talented Natalie Kilgore, who's incredible hand drawn illustrations "really tie the series together". You can purchase her work in her etsy shop, Natty Michelle Paperie or follow her blog, Natty Michelle, I'm loving her recent post on the failings of comparison.